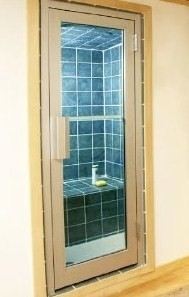 A review of the steam shower door and the various types that are available. Remember that quality comes first! What exactly is a steam shower door? Well, it is exactly what it sounds like – a door to cover the entrance of your steam shower unit. These doors serve two purposes which are design and functionality based. The functional purpose of the door is of course to close the perimeter of the unit and also to lock the steam inside of it. This is the essential job of the door as the steam cannot be allowed to escape. Why? If steam escapes through the door, or anywhere for that matter, it will eventually condense into water. You will have steam/water droplets covering the walls and surfaces of your entire bathroom which can cause mildew and rot. Having water on your walls opens up the possibility of mold growth and the walls of the entire house would become susceptible to rotting and water damage. Therefore, it is very important to purchase quality doors for your shower and once you install them, ensure that they are completely sealed and water proofed. The second purpose of doors is of course, design. The steam shower unit is the center of the bathroom and as a result a certain aesthetic is required. Many doors are very beautifully crafted using metal and glass. This can add a very modern feel to your bath which in turn increases the value of your home. There are so many types, shapes, sizes and design of steam shower doors, it can get downright confusing. Don’t worry, with this guide, you won’t get lost. This is definitely a popular choice of doors because it looks great, doesn’t take up much space and is easy to clean. Simply slide open and shut, this door is wonderful to use. If you’re low on bathroom space, then you should definitely purchase this door. The main disadvantages of this door, is that if you purchase a low quality one, there is a good chance you’ll have problems with the track. Simply keep it clean and change the rollers when necessary. The choice of purchasing doors with frames (mainly metallic) and doors with frames (all glass) is totally aesthetic. Some prefer the clean look of frameless, while others like the highlighting effect of metal frames. These doors open out much like an ordinary door. These are great if you have a large bathroom with enough space for it to open comfortably. Do make sure that you keep objects clear of the door so that when it opens there would be no collisions. This is as good as it gets when it comes to luxury and personalization. Once you’ve got a good glassworker, you can design etchings of your choice into the door. The design limits are endless. Have a look at some of the Kohler Steam Shower Doors that are available. Generally, steam shower doors can get pretty expensive. The usual price range starts from $700 and can get as expensive as $5,800. So when you do decide on a door, make sure that it is of the highest quality as you don’t want to have to buy a new door in a hurry. My view is to spend a little extra the first time around so that there won’t be a second time!